Sri Radha Krishna Temple ( Kannada - ಶ್ರೀ ರಾಧಾ ಕೃಷ್ಣ ಮಂದಿರ ) has deities of Radha and Krishna located at Rajajinagar, in North Bangalore, Karnataka, India. It is one of the largest ISKCON temples in the world. The temple is a huge cultural complex that was inaugurated in 1997 by Dr. Shankar Dayal Sharma. The project was conceived and executed by Madhu Pandit Dasa. Hare Krishna Hill is the hillock on which this temple is situated. ISKCON Bangalore is a charitable society with the objective of propagating Krishna Consciousness all over the world, as explained by Srila Prabhupada, whose teachings are based on Bhagavad-gita and Srimad Bhagavatam. In 1987, the society was operating from a rented house in Bangalore. In the year 1987, the leaders of the society applied to Bangalore Development Authority (BDA) for allotment of land to construct a grand temple and cultural complex. The land was allotted on 3 August 1988 – a seven-acre hillock, which was nothing but a huge piece of monolithic rock that could not be converted into sites. The BDA described it as "karaab land" (waste land). A temporary shed was constructed to set up a makeshift temple and the Deities of Sri Sri Krishna Balarama moved to this shed on the appearance day of Lord Balarama (September 1988). Around 1976, devotees from different parts of India and the world had initiated activities of ISKCON in different parts of South India like Bangalore, Hubli, Madras, etc. Sankirtans in the streets, enrolling Life Members, arranging programs in the houses, and arranging large public programs in pandals were being conducted. The society was registered in the year 1978 under the Karnataka Societies Registration Act, 1960. The objects of the society are derived from the Seven Purposes of ISKCON as stated by Srila Prabhupada. 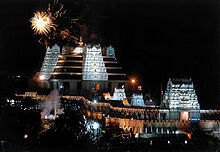 In May 1997, Bangalore ISKCON Temple was inaugurated by the ninth president of India - Shankar Dayal Sharma. There is a gold-plated dhwaja-stambha (flag post) 17 m (56 ft) high and a gold plated kalash shikara 8.5 m (28 ft) high. There is free distribution of Sri Krishna prasadam to all visitors during the darshana hours. Main shrine is of Radha-Krishna. Nitai Gauranga (Chaitanya Mahaprabhu and Nityananda). Srinivasa Govinda ( also known as Venkateswara ). The temple is open from 4:30 a.m. to 5:00 am. The day begins with a Grand arati ceremony called mangala-arati followed by worship of Tulasi Devi, Sri Narasimha Arati and Suprabhata Seva for Sri Srinivasa Govinda. The temple again opens at 7:15 a.m. for Shringara Darshana Arati. 5:15 a.m. to 7:15 a.m.: Japa Meditation session. The temple remains open till 1:00 p.m. In the evening the temple is open from 4:15 p.m. to 8:15 p.m. During weekends and public holidays Temple timings are 4:30 a.m. to 5:00 a.m. and 7:00 a.m. to 8:30 p.m. without any break in the afternoon. The evening arati starts at 7:00 p.m. where devotees sing kirtan. In the main temple the arati is performed by three priests. This arati is followed again by kirtan where devotees can be seen dancing to the rhythm of "Hare Krishna Hare Rama". The exit way after the Darshan from the main temple leads through a series of shops that offer books on Sri Krishna in all the possible Indian languages. Various shops which offer astonishing range of merchandise can also been seen giving away bags, pencils, compact discs, rings, cloths, and many other things all having a mark or a photo of Sri Krishna.Apart from these things, there are various shops which provide eatables of large varieties including laddoo, cheese cake, samosa, milk shakes, chithrana (lemon rice), puliogare, pakodas, etc. The overall view of these markets provide everything that a devotee visiting a temple would need. 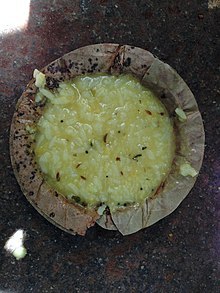 Khichdi India's national dish and superfood prasāda in ecofriendly Areca-leaf traditional Indian Donna at ISKCON Temple Bangalore. The Akshaya Patra Foundation is principally involved in implementing the Mid-Day Meal programme to the children in Government and Government-aided schools across India. It follows a Public-Private Partnership model of operation, and hence has been working in partnership with the Central and State Governments. It was set up in the year 2000 and runs the world's largest NGO-run Mid-Day Meal Programme. Akshaya Patra is currently operating in 27 locations across 11 states of India. It is reaching out to over 13,500 Government and Government-aided schools feeding 1.6 million children every day. Wikimedia Commons has media related to ISKCON Temple, Bangalore. The journal of the Hare Krishna Movement. News & views of the Hare Krishna Movement. ^ Jones, Constance; D. Ryan, James (2007). Encyclopedia of Hinduism. U.S.A.: Facts on File. p. 512. ISBN 0-8160-5458-4. ^ "Temple Schedule". ISKCON Bangalore. Retrieved 9 September 2018. ^ ISKCON Temple Bangalore website, Deities page. ^ Kumar Singh, Yogesh (2007). Sociological Foundation of Education. New Delhi, India: APH Publishing Corporation. p. 320. ISBN 81-313-0193-1. ^ "Obama’s accolade for Akshaya Patra" from Bangalore Mirror, 12-12-2008, hosted on the ISKCON Temple Bangalore website.